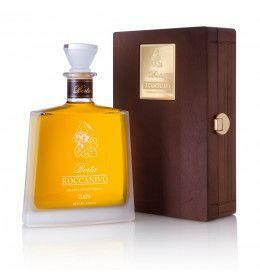 Grappa Roccanivo by Berta is produced starting from the pomace of Barbera. Produced with discontinuous distillation system and steamed copper boilers. E 'aged 8 years in woods of different essences and toasts. Give a unique and complex tasting experience. Warm and enveloping aroma, with notes of chocolate and vanilla, together with maraschino cherries and small berries. GRAPPA Grappa Roccanivo by Berta is produced starting from the Barbera pomace, which is sold by the best producers of the typical production areas. Produced with discontinuous distillation system and steamed copper boilers. E 'aged 8 years in woods of different essences and toasts. Give a unique and complex tasting experience. The warm and enveloping scent prepares you to savor many tastes, among which the sweetness of chocolate and vanilla, together with the harshest bit of morello cherry and small berries. DISTILLERY The Berta brothers are the owners of the historic Berta Distilleries located in Casalotto di Mombaruzzo, in the province of Asti, a company that contains some brands, one of which bears the name of the Italian Acquavitieri Corporation. The activity of the Berta Distilleries focuses on the most typical of Italian distillates, grappa: they are valuable grappa, designed to confirm the quality and the typicality of a great product of our country that, with the precious contribution of organizations such as the Guild , is one of the few to have been able to defend their identity internationally. The history of the Berta Distilleries began in the 50s thanks to Paolo Berta, descendant of a family of pharmacists and wine producers. The quality strategy is the only objective pursued since the beginning, resisting the temptations offered by a period of great well-being at national and international level that would have allowed them to place on the market innumerable quantities of bottles. In that context Paolo and his wife Lidia managed to maintain an artisanal dimension, thus consolidating the company's name, conquering an ever-growing number of enthusiasts. This philosophy was then passed on to the sons Gianfranco and Enrico, who today lead the family business with the same passion as their parents. As far as the Corporazione Acquavitieri Italiani brand is concerned, we find a series of fine aged grappas like the "Sant'Antonio", produced from Muscat grapes, and the "Rocchedirò" from Nebbiolo grapes from Barolo. Tasting Color: amber. Bouquet: warm and enveloping Taste: complex among which the sweetness of chocolate and vanilla stand out, together with the harshest points of the maraschino cherry and small berries. 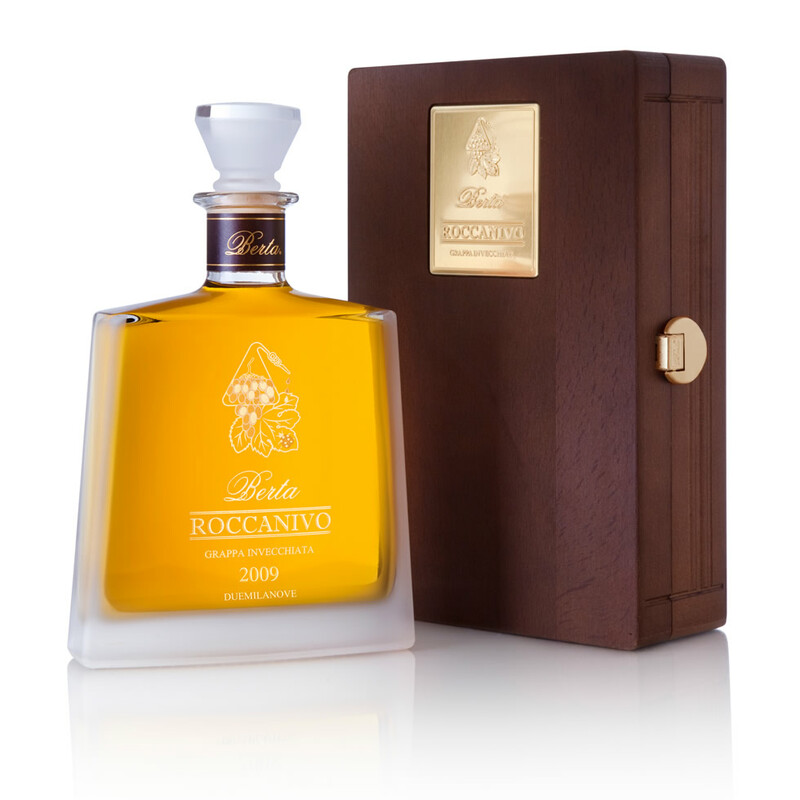 Grappa Roccanivo by Berta is produced starting from the Barbera pomace, which is sold by the best producers of the typical production areas. Produced with discontinuous distillation system and steamed copper boilers. E 'aged 8 years in woods of different essences and toasts. Give a unique and complex tasting experience. The warm and enveloping scent prepares you to savor many tastes, among which the sweetness of chocolate and vanilla, together with the harshest bit of morello cherry and small berries. The Berta brothers are the owners of the historic Berta Distilleries located in Casalotto di Mombaruzzo, in the province of Asti, a company that contains some brands, one of which bears the name of the Italian Acquavitieri Corporation. The activity of the Berta Distilleries focuses on the most typical of Italian distillates, grappa: they are valuable grappa, designed to confirm the quality and the typicality of a great product of our country that, with the precious contribution of organizations such as the Guild , is one of the few to have been able to defend their identity internationally. The history of the Berta Distilleries began in the 50s thanks to Paolo Berta, descendant of a family of pharmacists and wine producers. The quality strategy is the only objective pursued since the beginning, resisting the temptations offered by a period of great well-being at national and international level that would have allowed them to place on the market innumerable quantities of bottles. In that context Paolo and his wife Lidia managed to maintain an artisanal dimension, thus consolidating the company's name, conquering an ever-growing number of enthusiasts. This philosophy was then passed on to the sons Gianfranco and Enrico, who today lead the family business with the same passion as their parents. As far as the Corporazione Acquavitieri Italiani brand is concerned, we find a series of fine aged grappas like the "Sant'Antonio", produced from Muscat grapes, and the "Rocchedirò" from Nebbiolo grapes from Barolo.